Edmonia Lewis studies faces for truth or lies, checks classrooms for safety or traps. She’s sixteen, the daughter of an Ojibwe woman and a free man of color who crossed the country’s border for safety before the war between North and South. The nation is still divided when Edmonia leaves Oberlin under a cloud of accusation. Can she escape sharp words about poison, pearls, and stolen paints? She aims a chisel, swings a mallet, sculpts the brave, the good, a queen and a young woman like herself, splitting stone to become whole. Her marble statues now stand in museums, but much of the artist’s story was lost. Jeannine Atkins fills silences and folds facts into imagination to create a glimpse of what might have been. To see work by Edmonia Lewis, visit Pinterest. Pre-order at Amazon, Barnes and Noble, IndieBound. 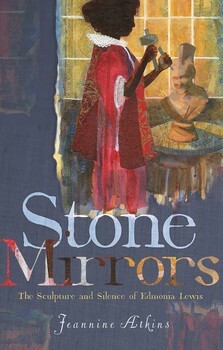 Take a look at the list of selected books used in researching Stone Mirrors. Download the Readers’ Questions and Writing Prompts. "Written with sensitivity and grace, this compelling title of injustice and vindication will leave readers pondering the complicated relationship between pain and art."